Duterte Orders Better Access To Birth Control In Majority Catholic Philippines : The Two-Way A law in the Philippines mandates universal access to contraception, but the Supreme Court and the Catholic Church have fought its implementation. President Rodrigo Duterte is pushing back. Philippine President Rodrigo Duterte, shown at a news conference at Davao's international airport on Dec. 17, says family planning is critical for reducing poverty. Philippine President Rodrigo Duterte has ordered government agencies to expand access to contraception, especially for poor women. By 2018, he instructs, all poor households in the country should have "zero unmet need for modern family planning." Duterte's executive order, signed Monday and announced on Wednesday, is the latest development in a long battle over birth control in the majority-Catholic Philippines. It pits the president, who says family planning is critical for reducing poverty, against the country's Supreme Court and Catholic leadership. Four years ago — after more than a decade of debate, negotiations and lobbying in Congress — the Philippines passed a law guaranteeing universal access to birth control. But the full implementation of that law has been blocked by court orders and budget cuts. Birth control has long been available in the Philippines for middle class and wealthy women, but it is priced out of reach of the country's poor. Abortion is illegal, with no express exceptions. More than half of all pregnancies in the Philippines are unintended, according to the Guttmacher Institute, and more than 90 percent of unintended pregnancies occurred in the absence of modern contraceptive methods. Polls show that most Filipinos support the Reproductive Health Law, which calls not just for access to contraception (subsidized or free, for poor couples), but also sexual health education and reproductive health care services. But it has been strongly opposed by the powerful Catholic Church. The law was immediately challenged as unconstitutional. The Supreme Court upheld some of the law, but imposed a restraining order limiting the contraceptive methods the government can distribute. Then Congress slashed the budget that was supposed to pay for free or low-cost contraception in many communities. In November, the president of the Catholic Bishops Conference of the Philippines thanked the high court for showing "caution and circumspection" on the implementation of the law. Why Philippine President Rodrigo Duterte Distrusts The U.S.
Archbishop Socrates B. Villegas urged couples to "shun the ways of selfishness" and avoid the "mutual self-degradation" of artificial contraception. Duterte's order calls on a wide range of government agencies to "intensify and accelerate" services that promote access to contraception. The order says more than 6 million Filipinas of reproductive age have no access to modern family planning methods, including 2 million women living in poverty. In a nod to the budgetary limitations, the order also calls for government offices to "engage, collaborate and partner with" nonprofits and the private sector to fully meet demand for family planning resources. 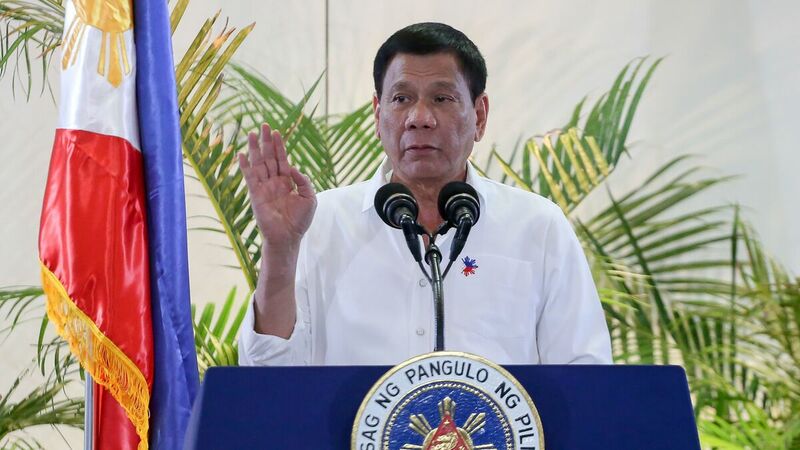 Duterte wants agencies to report back in six months on their progress, and factor expanded access to birth control into their future budget proposals. The president has made global headlines with his violent crackdown on the drug trade, which has killed thousands of people. The Catholic Church has joined international human rights watchdogs in criticizing the street killings, while Duterte remains popular among the general public. The famously blunt and frequently profane president has previously indicated his willingness to defy the Catholic Church on the issue of contraception, too. "I will reinstall the program of family planning." Duterte said in June, before taking office, the AP writes. "Three's enough."